MEDC LD15 High Intensity LED Beacon, Exd, Weatherproof only version, IP66 and IP67, designed for use in potentially explosive atmospheres and harsh environmental conditions. 12-48 VDC. 5 selectable functions. These certified LED Strobes have been designed for use in potentially explosive atmospheres and harsh environmental conditions. The enclosures are suitable for use offshore or onshore where light weight combined with corrosion resistance is required. The housings are manufactured completely from a UV stable glass reinforced polyester. Stainless steel screws and mounting bracket are available ensuring a totally corrosion free product. The LD15 incorporates a low maintenance, innovative LED array, which has a life of up to 54,000 hours. The low current consumption design allows an energy efficient solution without compromising light output. Units can be painted to customers specification and supplied with identification labels. ATEX Certified Ex II 2GD. Class II, Div. 2 Groups F & G.
Certified temperature -55oC to +70oC. Optional cast aluminium or wire stainless steel guard. Certified to: EN60079-0, EN60079-1, EN60079-31. Ex II 2GD, Ex d IIC T5/T6 Gb, Ex tb IIIC T85�C/T100�C Db. IECEx Ex d: Cert. no. IECEx BAS 05.0048X. Certified to: IEC60079-0, IEC60079-1, IEC60079-31. Ex d IIC T5/T6 Gb, Ex tb IIIC T85�C/T100�C Db. CUTR Ex d: 1Ex d IIC T5/T6 Gb, Ex tb IIIC T85�C/T100�C Db. Inmetro Ex d:	 Ex d IIC T5/T6 Gb. UL Haz Locs: Listing no. E187894. UL Ord Locs/Marine: Listing no. S8128. Visual Signal Device. UL listed for use in USA:	 Class I, Div. 2, Groups A, B, C & D.
Class II, Div. 2, Groups F & G.
Class I, Zone 1, Aex d IIB & IIC T4/T5/T6. UL/ULC listed for use in Canada: Class I, Div. 2, Groups C & D.
Class I, Zone 1, Ex d IIB T4/T5/T6. SIL 1:	 SIL1 certification to IEC61508. Certification No. FSP 13005. Material Body: Glass reinforced polyester. Wire Guard (optional): Stainless steel wire. Cast Guard (optional): Aluminium LM25M. Finish: Natural black or painted to customer specification. Voltage: 12V d.c. to 48V d.c. LED Life: Up to 54,000 hours. Function: Steady, 60, 80 & 120 fpm, Double Flash. Certified Temp: -55oC to +70oC (T5). -55oC to +55oC (T6). Optional: 1 x M20/M25, 3 x M20/M25 entries. Terminals: Direct mount: 12 x 2.5mm2/14AWG. Pipe mount: 8 x 14AWG. > WEATHERPROOF > BEACONS : 96 Items found. E2S B200SLF Status Beacon with 5W permanent filament bulb. Surface mount. Bayonet fixing lens. Stainless steel fixings. IP65. GOST-R Cerfified. E2S B100SLF Panel Mount Status Beacon with 5W permanent filament bulb. Incorporates a pluggable terminal block. Bayonet fixing lens. Stainless steel fixings. IP65. GOST-R Cerfified. E2S B300SLF Status Beacon with 25W permanent filament bulb. Surface mount. Bayonet fixing lens. Stainless steel fixings. IP65. GOST-R Cerfified. E2S B200FLF Blinking Beacon with 5W filament bulb. Surface mount. Bayonet fixing lens. Stainless steel fixings. 12VDC, 24VDC, 48VDC, 115VAC or 230VAC versions. IP65. GOST-R Cerfified. 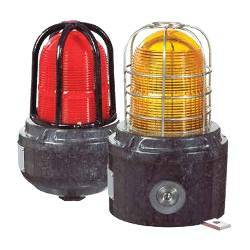 E2S B300SLH Status Beacon with 20/25W halogen lamp. Surface mount. Bayonet fixing lens. Stainless steel fixings. IP65. GOST-R Cerfified. E2S B100FLF Panel Mount Beacon with 5W blinking filament bulb. Incorporates a pluggable terminal block. Bayonet fixing lens. Stainless steel fixings. 12VDC, 24VDC, 48VDC, 115VAC or 230VAC versions. IP65. GOST-R Cerfified. E2S B400SLF Status Beacon with 40W permanent filament bulb. Surface mount. Bayonet fixing lens. Stainless steel fixings. IP65. GOST-R Cerfified. E2S B200LDA LED Permanent Beacon. Surface mount. Bayonet fixing lens. Stainless steel fixings. 10-30VDC or 90-230VAC Versions. IP65. GOST-R Cerfified. E2S B100LDA Panel Mount LED Permanent Beacon. Incorporates a pluggable terminal block. Bayonet fixing lens. Stainless steel fixings. 10-30 VDC or 90-230VAC versions. IP65. GOST-R Cerfified. E2S B400SLH Status Beacon with 35/40W permanent halogen bulb. Surface mount. Bayonet fixing lens. Stainless steel fixings. IP65. GOST-R Cerfified. 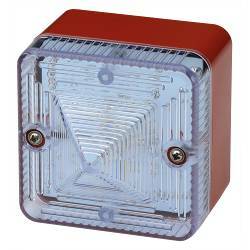 E2S ST-L101H compact and robust LED Array Beacon for STA or STB junction boxes. 24 Superflux type high output LEDs. Over 120 candela of light. Steady or flashing mode. 24DC or 230AC. IP66. GOST-R approved. Optional UL version. 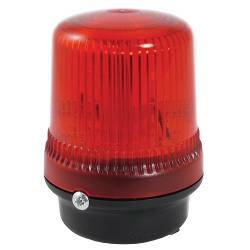 E2S ST-L101X compact and robust 5 Joule Xenon Strobe Beacon for STA or STB junction boxes. Standard 1Hz flash rate. 12VAC, 24VAC, 48VAC, 115VAC, 230VAC, 12VDC, 24VDC or 48VDC Versions. Stainless steel fixings. IP66. CPD, VdS and GOST-R Approved. Optional UL version. Back box not included. E2S L101X compact and robust 5 Joule Xenon Strobe Beacon. Standard 1Hz flash rate. 12VAC, 24VAC, 48VAC, 115VAC, 230VAC, 12VDC, 24VDC or 48VDC Versions. Stainless steel fixings. IP66. CPD, VdS and GOST-R Approved. Optional UL version. 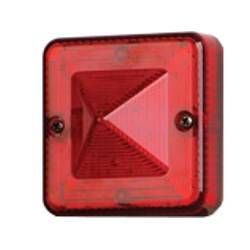 E2S B100STR Panel Mount Xenon Strobe Beacon with 0.75 Hz flash rate. Incorporates a pluggable terminal block. Bayonet fixing lens. Stainless steel fixings. 10-30VDC/AC, 115VAC or 230VAC Versions. IP65. GOST-R Cerfified. E2S B300FLF Blinking Beacon with 25W filament lamp. Surface mount. Bayonet fixing lens. Stainless steel fixings. 12VDC, 24VDC, 48VDC, 115VAC or 230VAC Versions. IP65. GOST-R Cerfified. E2S L101H compact and robust LED Array Beacon. 24 Superflux type high output LEDs. Over 120 candela of light. Steady or flashing mode. 24DC or 230AC. IP66. GOST-R approved. Optional UL version. 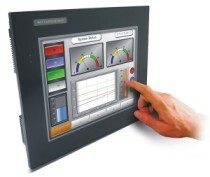 E2S IS-pB1 compact Panel Mount LED Indicator. 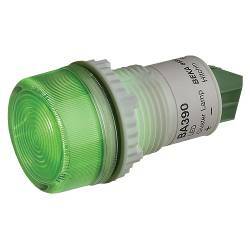 Provides reliable cost-effective visual status indication in all hazardous areas. Nylon 6 housing and Polycarbonate lens. IP66. ATEX, IECEx and FM approved. 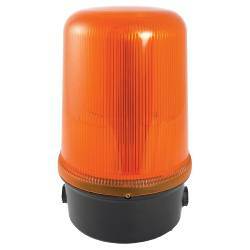 E2S B200STR Xenon Strobe Beacon with 0.75 Hz flash rate. Surface mount. Bayonet fixing lens. Stainless steel fixings. 10-30VDC/AC, 115VAC or 230VAC Versions. IP65. GOST-R Cerfified. 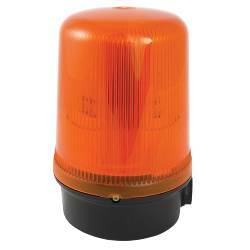 E2S B300FLH Blinking Beacon with 20/25W halogen lamp. Surface mount. Bayonet fixing lens. Stainless steel fixings. 12VDC, 24VDC, 115VAC or 230VAC Versions. IP65. GOST-R Cerfified. 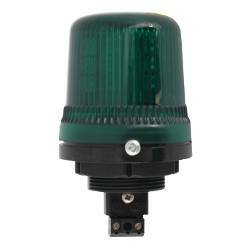 E2S B300STR Xenon Strobe Beacon with 1Hz flash rate. Surface mount. Bayonet fixing lens. Stainless steel fixings. 12VDC, 24VDC, 48VDC, 115VAC or 230VAC Versions. IP65. GOST-R Cerfified.